We are saddened to learn of the passing of bass clarinet legend and ICA Honorary Member Harry Sparnaay on December 12, 2017. Sparnaay became an Honorary Member in 2015. Sparnaay received his education (a performer’s degree in clarinet) at the Conservatory of Amsterdam with Ru Otto. 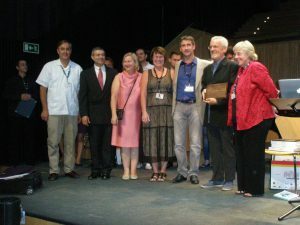 He specialized in bass clarinet and won the first prize at the International Gaudeamus Interpreters Competition, a first for a bass clarinet player. Sparnaay performed as a soloist all over the world and was featured performer with countless orchestras of note. One of his most significant contributions to the clarinet is the catalog of more than 650 works that were written for him by composers such as Morton Feldman, Lucaino Berio, Iannis Xenakis and others. Recorded on more that 60 CDs, Sparnaay will forever be an vital part of our clarinet history, and he will deeply missed. 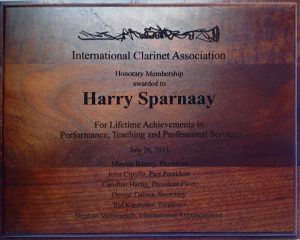 Please look for a tribute to Harry Sparnaay in an upcoming issue of The Clarinet. To learn more about Harry Sparnaay, please visit his personal website www.harrysparnaay.info/.